Deb Mansfield is an Australian artist whose primary concern is photography in the expanded field. Experimenting with the surface and material composition of the photographic image, Mansfield challenges our expectations of what a photograph is. Her photo tapestries achieve this feat by embracing unconventional printing techniques and converting the image into a textile. Produced mechanically, a photo tapestry is a tactile translation of a photographic image. A mechanical loom replicates a digital photographic image through the weaving of coloured thread. This process involves a suspension of the artist’s hand, wherein Mansfield relinquishes certain formal decisions to the imposed aesthetics and chance irregularities of a machine. In '(Swinging) I am trying to quieten my love for you' the hand of the artist is reasserted in the production of the work’s frame. This circular bronze frame has been hand cast, its matte patina a trace record of the act of polishing its surface with beeswax. The frame, along with the tactility of the image surface, gives the work a textured physicality. '(Swinging) I am trying to quieten my love for you' is an inverse photo-tapestry. What we see is the tapestry’s underside with colours and composition reversed, much like a film negative. 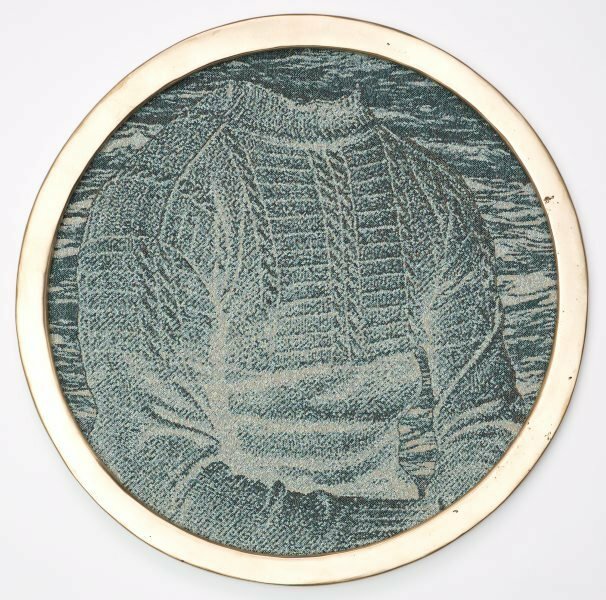 The woven image depicts a headless sailor against a shallow and tightly cropped backdrop of the sea. Without a face, the sailor is only identifiable by his Guernsey jumper; traditionally knitted by a wife and prevalent from the 19th century onwards, the jumpers had unique patterns that identified the wearer’s family name and connection. A talisman of affection, the jumpers were also used to distinguish the men when they drowned. The knitted jumper is an analogue echo of Mansfield’s tapestry, behind which also lies an emotive testament. Buried underneath the image and encased in the hand cast bronze frame is a love letter to an unknown subject. This work extends Mansfield’s preoccupation with liminal or indeterminate geographies and in-between spaces, specifically islands and boundary lines. With its seascape and circular frame this work resembles a porthole, which is itself a kind of island. This strictly delineated view of an inaccessible ocean landscape positions the viewer aboard an imaginary ship. Their gaze is directed outwards from a constricted space. The figure that obscures their view and their horizon line, the headless sailor, is an anticipation of loss. He is both suspended atop and consumed by the water, trapped in the indeterminate space that delineates life and death. Signed and dated. l.r verso backing, pencil 'DEB MANSFIELD '15'.